It's a great day! I read an article from Robin Sharma in one of his recent news letters and i thought it best to share it. You are born into genius, but have you resigned yourself to mediocrity? 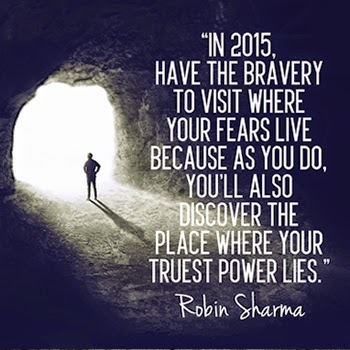 I’m on fire to help you make 2015 the year you breathe reality into your most beautiful dreams. Let us accept nothing less. I suggest we start our work together this year with a simple idea: if you run the rules most people run, you’ll get the results most people receive. #1. Generosity beats scarcity in every situation. #2. If you’re the most successful person in every room, find a new room. #11. What the victim calls luck, the hero calls relentlessness. #12. Be polite. Be on time. Be optimistic. #13. Make each fresh day of this new year a little better than yesterday. Daily optimizations will soon lead to exponential improvements. #14. Make time to rest. Sleep is a secret weapon of true A-Players. #15. To double your income, triple your investment in your professional education and on your personal development. #16. Trust your instinct more than what society says is reasonable and possible. #17. Go directly to where your fear lives because on the other side of that is where your power lies. #18. Genius is less about genetics and more about obsessive amounts of practice. #19. Never be too busy to be kind. #20. Remember that life’s just too short to play small with your potential this New Year.